Lance Cpl. Andreas Padilla, left, of Los Angeles, and Sgt. 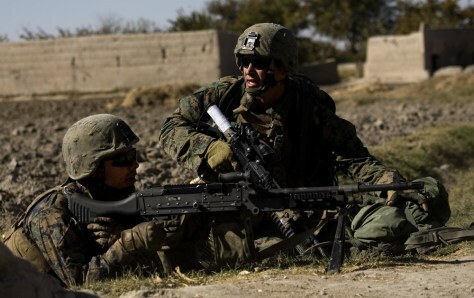 Freddia Cavasos, of Visalia, Calif., with India company, 3rd Battalion 5th Marines, First Marine Division, return fire during a patrol in Sangin, Afghanistan on Sunday.